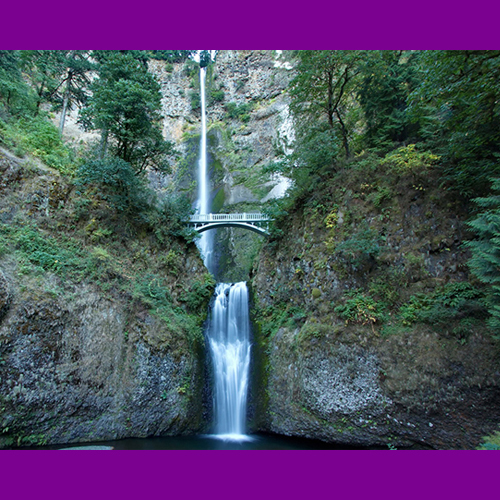 Multnomah Falls is a jewel on the Historic Highway, bringing more people to view it's majestic beauty every year. This beautiful waterfall offers two lengths of hike to view it. You can talk the short walk to the Benson Bridge, or cross it and continue on the climb to the top of the falls. This trail begins at Multnomah Falls trailhead and climbs 0.2 mile to the Benson Bridge, built in 1914 by one of the builders of the old highway. Beyond the bridge, the asphalt trail switchbacks up steeply for another mile to a ridge crest. Look for Columbia River views as you ascend. From the top, the trail drops slightly to a junction with a trail labeled "viewpoint". The asphalt follows the side path to the Multnomah Falls Upper Viewpoint, where a balcony sits at the lip of the falls looking down on the lodge and creek below. Ditch the car and take the Columbia Gorge Express! The round trip shuttle service starts at Gateway, and stops at Rooster Rock Park, and continues to Multnomah Falls!